I love hosting parties and love that we had an excuse to pull out all of the fun pink and gingham for this southern baby shower. It was a great time showering Lily and mom-to-be this past weekend with this southern themed baby shower- complete with mason jars, scrap fabric banners and all the gingham I could find! It was fun to think pink! We can’t wait wait to meet sweet Lily! The shower was inspired by the darling “Penelope” Pottery Barn bedding – pale pink and green with birds- that the mother is decorating the nursery with. Front Porch shot to welcome our guests include this sweet simple banner and a big stuffed bear. We used “Mama Do You Love Me” children’s book as a guest book. Also, sweet pink and white cookies were placed in bowls for party favors and a sock monkey collection kept an eye on things!Found a good use for the old chalkboard too! Of course, a sweet southern baby shower needs lots of flowers! 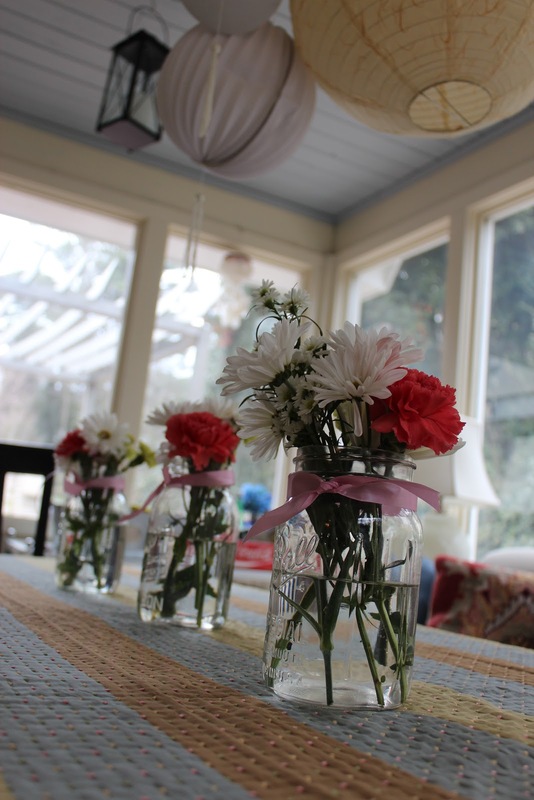 I used various grocery store bouquets to make the tables and house more festive. The ribbon theme continued with a scrap ribbon and fabric garland on the fireplace. I just love making something from nothing! Found these great printable letters from pinterest. Used brown paper I had on hand and some jute twine. *Tip- print the entire alphabet and do not glue the letters to the brown craft paper and use them over and over to spell out different messages. Love this idea to have on hand for any celebration! I wish I would have done them with clothespins- even easier!